JYJ’s Kim Junsu’s first solo album is receiving explosive interest in Japan. 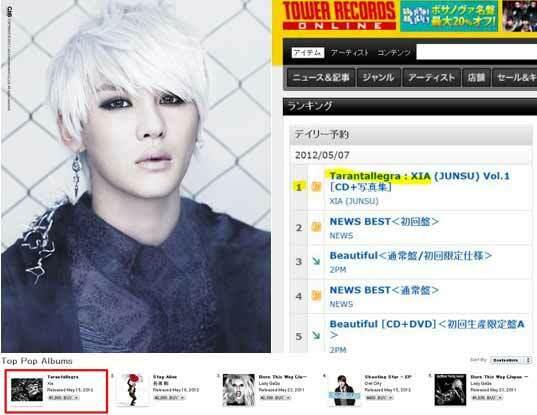 On May 18, Kim Junsu’s agency, C-Jes Entertainment revealed that Xia Junsu’s first album Tarantallegra had reached first on Japan’s iTunes′ pop albums chart. His album ranked ahead of albums from global superstars such as Justin Bieber and Lady Gaga. Even prior to the album’s release, the album had placed first in pre-orders on Japan’s music sites such as Tower Records, while selling out on the day of its release, proving that the solo Kim Junsu is just as, if not more popular, than ever.